The Fire Department is located one block north of the Pike County Court House. Pictured here is the new firehouse extension to the old firehouse. 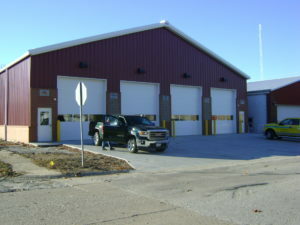 The Pittsfield Fire Department is a 30 member volunteer department with primary responsibilities in the City of Pittsfield and secondary in the area surrounding the City. They cover approximately 160 square miles with a population of 7,100. The Fire Chief is responsible for directing the firemen at fires and accidents, keeping records of incidents, maintenance of fire equipment and buildings and training of firemen.